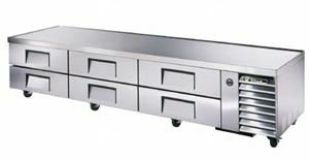 True's refrigerated chef bases are designed with enduring quality that protects your long term investment. Oversized, environmentally friendly (134A) forced-air refrigeration system holds 33 degrees F to 38 degrees F (.5 degrees C to 3.3 degrees C). Cabinet top is one piece, heavy duty reinforced stainless steel. Drip resistant "V" edge protects against spills. Supports up to 2000 lbs. (908 kg). Each drawer accommodates two (2) full size 12"L x 20"W x 4"D (305 mm x 508 mm x 102 mm) food pans (sold separately).